Lately I’ve been working on getting a CEP panel working for reading and writing metadata to / from images in Adobe Bridge. Many years ago I did create a File Info panel using the File Info SDK with MXML and ActionScript3, but Adobe dropped compatibility with File Info Panels created that way quite a while back. Although Adobe do still offer a File Info SDK, it seems the current recommended way to do most things in this sort of vein is with CEP. So I thought I better try creating my panel using CEP, thinking that the File Info panel may be retired soon while CEP will hopefully have a longer life. I haven’t found it very easy, so I thought I would share some of the stuff I’ve had to work out so far. No doubt I will be posting at least one more of these as I discover more issues. 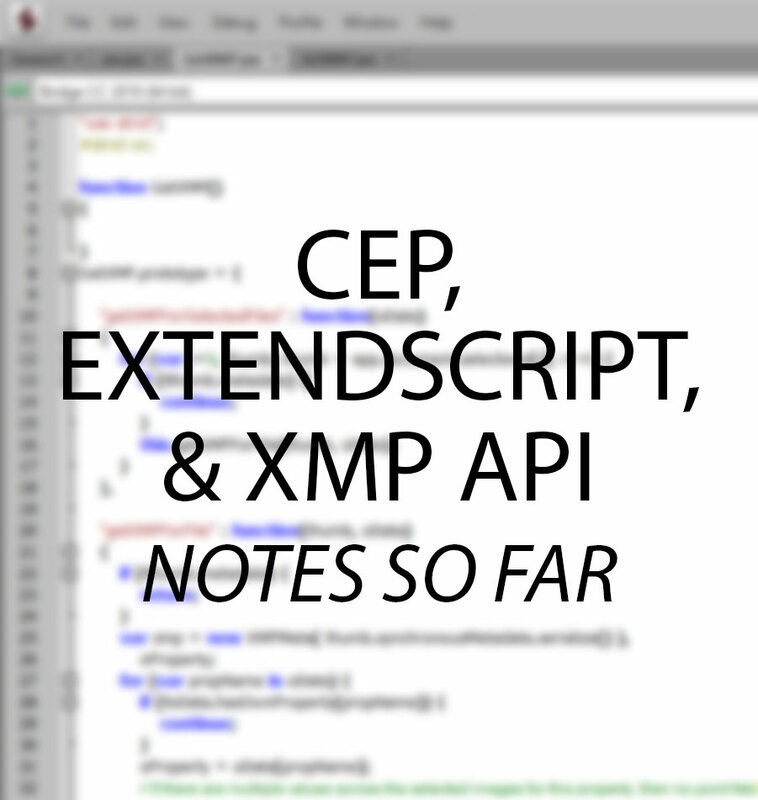 The points below relate to CEP, the ExtendScript portion of CEP, and the XMP API for ExtendScript. This is not possible. Instead you have to download and install the ExtendScript Toolkit. Start the Toolkit and open the ExtendScript file you want to debug. Open the application you want to debug it with (in my case Bridge), then manually run the function(s) you need to debug from the Toolkit. The ExtendScript Toolkit is pretty poor for object inspection. Some objects are listed in the Data Browser pane, but many are not, or don’t list what properties and methods they have. Similarly, entering a variable you want to inspect in the console will just print the toString() of that object, not show the actual object with its properties and methods like you’d get in a web browser console. This is particularly annoying due to the lack of documentation on the various classes. You can’t even inspect instances of some of the classes yourself to see what properties / methods are available. When trying to find the path to a more complex nested property, it can be useful to use an iterator. Then on each iteration pause and check the current node to see exactly what the path to it is, e.g. When trying to open a RAW file (CR2 in my test), then trying to open it for updating the XMP metadata fails, e.g. When trying to write straight to the XMP sidecar file using the File class (rather than XMPFile) you must explicitly set the file encoding, e.g. As otherwise ExtendScript doesn’t detect the file encoding correctly and uses your system default encoding. This means when you try and write the serialized XMP (which is UTF-8) into the file the write will fail. At least, this is the case on my Windows PC. In the case where your system encoding is UTF-8, or if your XMP sidecars contain a UTF-8 BOM then you probably wouldn’t need to set the file encoding, since it would already be correct. Say you want to get all the values of dc:title, which is an alt-lang type. You can’t use getLocalizedText() as that’s for getting a single value where you know what locale you want. I want each locale with its value. However, I didn’t read the docs carefully enough as locale is apparently only set by calls to getLocalizedText(). Weirdly it was set on the first item though, but was actually set to the namespace?! On the second iteration it then pulled the lang attribute. So it must iterate through the node values and node attributes as if each was a separate node. You could put something together that uses this method, first pulling the values, then the lang values, and finally consolidating them together. But it seems a bit messy. Now maybe I’m doing something wrong there, but it seemed to keep going through values (got up to 8 before I cancelled it), even though I only had one entry in the array. These seem to be documented only in information on certain methods, not under the documentation on the XMPConst class. As I mentioned earlier, the Toolkit is quite poor for inspection, so unfortunately you can’t inspect the XMPConst object to see exactly what properties it contains. There could actually be more than these. The item is an array (of type alt, bag, or seq). Creates a bag (unordered array). Item order is significant. Implies XMPConst.PROP_IS_ARRAY. Creates a seq (ordered array). Items are mutually exclusive alternates. Implies XMPConst.PROP_IS_ARRAY. Creates an alt (alternative array). The item is a structure with nested fields. Creates a struct (node with rdf:parseType=”Resource” set). Will result in an array with a x-default and en-GB entries in the array, but both with the 'X default text value'. So it seems like the first ‘real’ RFC 3066 language you set is used as the x-default value, i.e. you can’t have an alt-lang array where the x-default value is unique, other than where the x-default value is the only value. However, this is not how the metadata panel in Bridge works or the XMP File Info panel works. In both of these, only the x-default value is shown, and changing this value will only save the change to the x-default value – all other language values are left unchanged. I don’t know if this is the correct behaviour or not, but I am inclined to copy Bridge / File Info panel’s behaviour, and allow unique x-default values. // After finishing loading the jsx file refered in the manifest.xml, please use evalScript of CSInterface to load other jsx files. // "anotherJSXFile" is not the first loaded jsx file, so the value of "$.fileName" in it's stage is correct. // Or in the first loaded jsx file, load another jsx file, and the value of "$.fileName" is correct in this file. // Given the code is running this example.jsx which is referred in the manifest.xml. // In the stage of "hardCodeJSXFile", the value of "$.fileName" is correct too. In that first example, how are you meant to be getting the path of ‘anotherJSXFile’ so you can load it to find out what the extension path is? Likewise on the second example, how is your JSX going to get the path to ‘hardCodeJSXFile’ so it can be loaded? You can’t use absolute paths, unless you are the only person ever going to use the extension / panel you’re working on. If you use an //@ / # include line in your main JSX, the path to whatever file you want to load won’t be correct, and your JSX won’t work. If you use $.fileName from your JSX (or eval it as JSX from your JS), it will be an integer. You can’t use a relative path as the CWD is not the extension dir. If you create a new File('./') and get the fsName, you’ll find the current path is the Bridge program directory. If you include multiple ScriptPath nodes in your manifest.xml, only one will be loaded. From your JS will load the file test2.jsx from the host subdir within your extension folder.